We report a case of a female who had a left thoracic kidney associated with left Bochdalek hernia. A 20 year-old female presented with complaints of dry cough for 15 days and intermittent fever of 4 days duration. No history of abdominal pain or increase in frequency or burning micturation. There was no significant past history of any abdominal trauma. The patient does not have any siblings and her mother denied any history of infections or drug abuse during pregnancy. Her menarche was at 13 years and there were no menstrual irregularities. 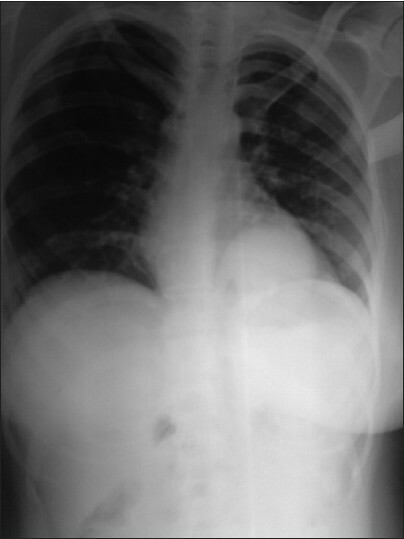 As part of routine investigation chest X-ray was done which showed a left retro cardiac homogenous opacity [Figure 1]. Rest of lung fields appeared normal. Abdominal ultrasound (US) showed the right kidney to be normal; left kidney was not visualized. Ultra sonography of thorax revealed the left kidney in the thorax. Postcontrast computer tomography (CT) with 3D reconstruction showed posterior diaphragmatic hernia with herniation of the left kidney into the thorax which was posteriorly located, suggestive of left-sided Bochdalek hernia with the upper pole of left kidney in the thorax [Figure 2] and [Figure 3]. There were no other associated congenital anomalies of renal vessels or any other abdominal organ. 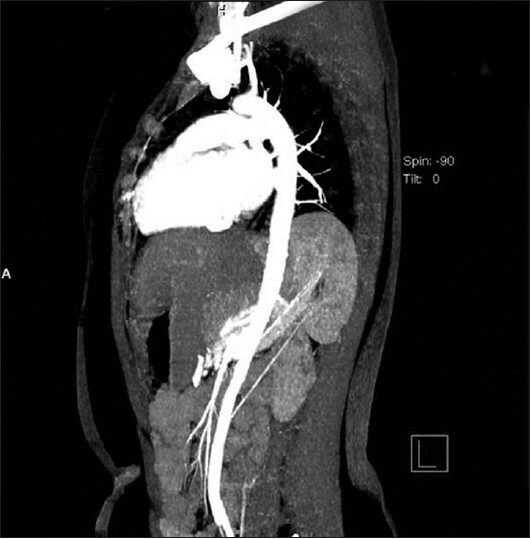 An intra venous pyelography done confirmed the diagnosis of a normally located right kidney and properly functioning kidney partially located in the left side of thorax. Patient was treated symptomatically for her fever and cough. She was informed of the abnormality and counseled regarding it. As there were no direct complications due to the hernia or ectopic kidney no definitive treatment was initiated for it. The posterolateral defect in the diaphragm through which abdominal organs might herniate into the thorax was first described by Vincent Alexander Bochdalek, a Czech anatomist in 1848, hence bears his name Bochdalek's hernia. It occurs more frequently on the left side. This is presumably due to the fact that the pleuroperitoneal canal closes earlier on the right side, or due to the narrowing of the right pleuroperitoneal canal by the caudate lobe of the liver. , It is common in males than in females in the ratio 2:1. The ectopic kidney is usually pelvic, iliac, abdominal, thoracic, contra lateral, or crossed. Ectopic kidney is slightly common on the left side as was the case in our patient. , The intrathoracic location of an ectopic kidney is the rarest with a reported incidence of 5% of all ectopic kidneys. The association of a Bochdalek hernia and intrathoracic renal ectopia is even rarer at 0.25%. During embryogenesis the developing kidney which is located in the pelvis moves upwards to fuse with the adrenals; and thereby this ascent is arrested. Sometimes, this upward progression of the developing kidney does not stop at its designated point and thus the kidney reaches into the thorax. One of the reasons ascribed to this disorderly ascent is the delay in closure of the developing diaphragm. The ectopic kidney has been known to be associated with many other defects ranging from acromelic frontonasal dysplasia to Williams syndrome. However there were no other deformities in this patient. We are presenting this case because of its rarity in reported literature. 1. Fiaschetti V, Velari L, Gaspari E, Mastrangeli R, Simonetti G. Adult intra-thoracic kidney: A case report of bochdalek hernia. 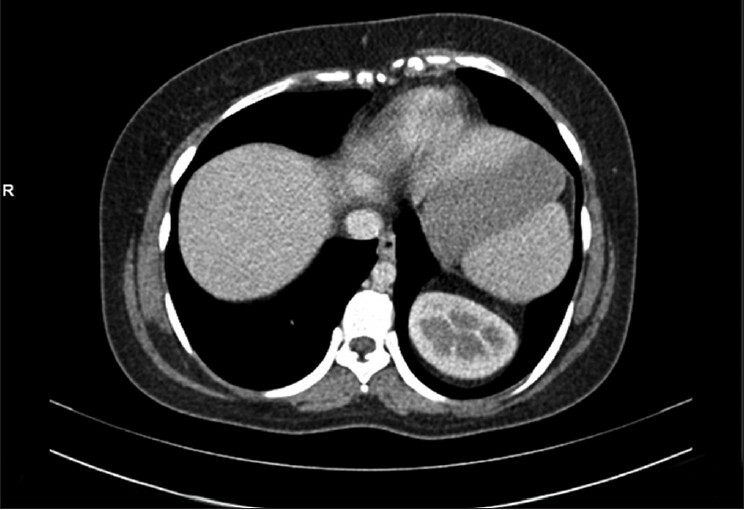 Case Report Med 2010;2010. pii 975168. 2. Motiani PD, Gupta PK, Aseri KC, Agarwal KC. Bochdalek hernia on the right side in an adult - case report and review. Lung India 1991;9:63-5. 3. Tubbs RS, Gribben WB, Loukas M, Shoja MM, Tubbs KO, Oakes WJ. Franz Kaspar Hesselbach (1759-1816): Anatomist and surgeon. World J Surg 2008;32:2527-9. 4. Mensah YB, Forson C. Left thoracic kidney: A rare finding at intravenous urography. Ghana Med J 2010;44:39-40. 5. Woodward M, Evans K. Abnormalities of migration and fusion of the kidneys. Oceanan Therapeutics Ltd.; 2011. [monograph on the Internet]. Available from: http://www.pediatricurologybook.com/kidney_fusion.html [Last accessed on 2011 Dec 8]. 6. Drop A, Czekajska-Chehab E, Maciejewski R, Sta?kiewicz GJ, Torres K. Thoracic ectopic kidney in adults. A report of 2 cases. Folia Morphol (Warsz) 2003;62:313-6. 7. Ramaprasad G, Vidyasagar B. Bochdaleks hernia simulating pleural effusion. Lung India 1989;7:95-6. 8. Mirza B, Bashir Z, Sheikh A. Congenital right hemidiaphragmatic agenesis. Lung India 2012;29:53-5. 9. Hithaishi C, Padmanabhan S, Kumar BS, Kalawat TC, Venkatarammappa M, Siva Kumar V. Ectopic thoracic kidney- a case report. Indian J Nephrol 2003;13:79-80. 10. Sheehan JJ, Kearns SR, McNamara DA, Brennan RP, Deasy JM. Adult presentation of agenesis of the hemidiaphragm. Chest 2000;117:901-2. Pande, S. and Padma, S. and Sundaram, P.S.